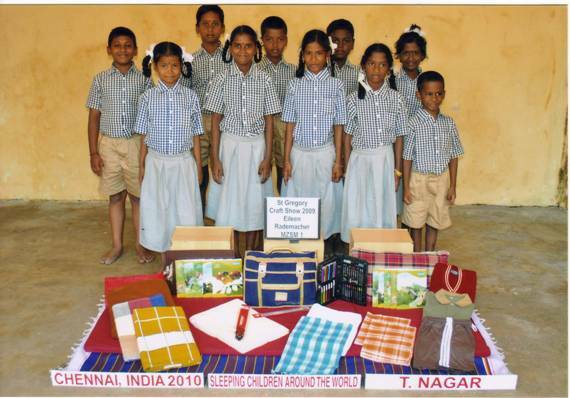 These are the children that received the bedkits with the money raised at my recent Art & Craft show. What a great group of children! Thank you so much for your support. 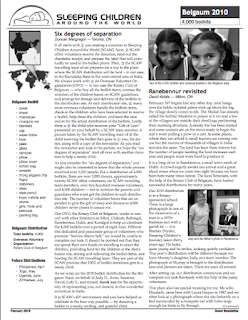 The donor newsletter for the Belgaum bedkit distribution has gone to print and can be downloaded from the Sleeping Children Website. Photos are available in the Belgaum 2009 Photo Album. You can view them by clicking the link above. 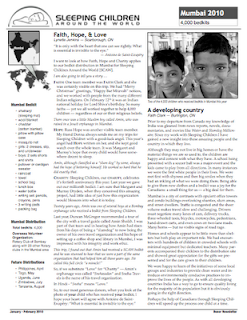 The donor newsletter for the Mumbai bedkit distribution has gone to print and can be downloaded from the Sleeping Children Website. Photos are available in the Mumbai 2009 Photo Album. You can view them by clicking the link above. 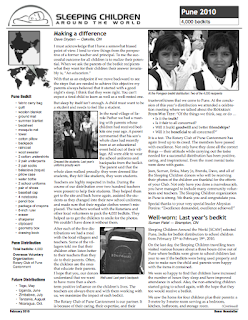 The donor newsletter for the Pune bedkit distribution has gone to print and can be downloaded from the Sleeping Children Website. Photos are available in the Pune 2009 Photo Album. You can view them by clicking the link above. Click graphic for a larger version. The interview pushed Tom Belton into memory territory he thought he had put behind, and a trace of discomfort showed. The retired Ottawa businessman is a longtime volunteer with one of the country's lesser-known charities -- Sleeping Children Around the World (SCAW). Founded in 1970 by Margaret and Murray Dryden, parents of MP and hockey great Ken Dryden, its aim is simply to provide the world's poorest children with some basics, such as a bed, a toothbrush and minimum school supplies. The Drydens' aim was to give the gift of a good night's sleep to a million of the world's poorest children. That goal was passed two years ago. As a volunteer, Belton's job, like hundreds of other volunteers, is to deliver donated bedkits, conduct a brief interview, and report back to the person who donated the $35 that paid for the bed package. "The names don't stay with you, but I remember a mother (in India), obviously undernourished, with her daughter, about eight, standing beside her looking well-nourished." "The father had died of cancer years earlier leaving the widow to raise two daughters on her own. There's no social system to assist a family like this," he says. "They lived in a hut without running water, toilet or electricity. Cooking was over an open fire. Mother worked in a quarry, smashing rock into sand by hand, using a heavy hammer. She was paid the equivalent of $1 a day. It was obvious most of the money went to food and most of the food went to her children. She said the bedkit would be shared by her two children and was thrilled that they could go to school rested, and with some basic school supplies. Their only way out of that place of poverty was through education. I often wonder what future is ahead for that family." 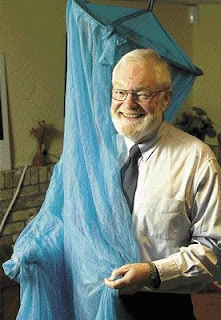 Volunteers like Belton, many of them with service club backgrounds, pay their own way to the most impoverished parts of the world to distribute bedkits, take photos, and make certain donors see the results of their charity. SCAW guarantees that every donated cent goes to the purpose advertised. All work that goes into the complex process of doing charity in foreign countries is volunteered. What little paid management is required is covered by a legacy fund established by the Drydens. "There was a boy, about 10, in a small town in Colombia, high in the Andes. His mother was in her 40s, but looked twice that. She wheeled him in to receive his bedkit. We guessed the problem was cerebral palsy. He was in a modified pram, his long legs were leading, straight out in front of him, and his head was under the handle. "We (volunteers) visited their home. Two rooms. The mother and the boy slept in one room. The mattress from the bedkit was placed over a cot, and a log was rolled against the cot to prevent him from falling out. We saw no medications." Belton gave himself a shake, grinned, and produced a pile of photos taken during the trip to India he has just returned from. There are bright and happy school kids showing off their new clothing. In their world, a pencil is a treasure. His volunteering has over the years taken him to dark corners in Tanzania, Columbia, Honduras and India. SCAW has left its mark in places like Bangladesh, Kenya, Togo and many regions of India. The organization reaches into 32 countries. Advances in communications technology make it possible to involve donors in the project in ways not possible in the 1970s. Volunteers on site photograph recipients with their bedkits spread out around them, and with a card bearing the name of a donor to show them their money, turned into essentials, has reached its destination. The use of e-mail grows. Each kit includes a mat or mattress, pillow, sheet, blanket, mosquito net in countries one is needed, clothing, towel and school supplies. Two thirds of donations come from Canadian schools, churches and service clubs. The other third is from the business community. It's a success story that has grown without help from governments or international corporations. Donations from such bodies, the Drydens knew, always come with strings attached. SCAW is a case of people helping people, with emphasis on the personal touch. 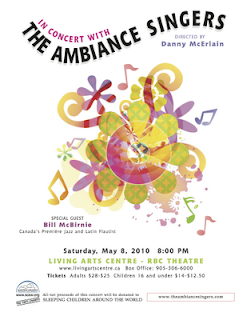 Contributions are tax deductible and can be made through a website at scaw.org, or call toll free to 1-866-321-1841, or mail to SCAW, 28 Pinehurst Cres, Toronto, M9A 3A5. 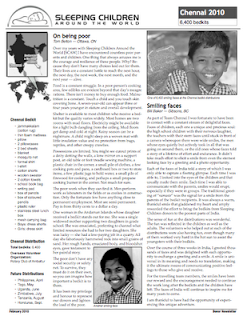 The donor newsletter for the Chennai bedkit distribution has gone to print and can be downloaded from the Sleeping Children Website. Photos are available in the Chennai 2009 Photo Album. You can view them by clicking the link above. 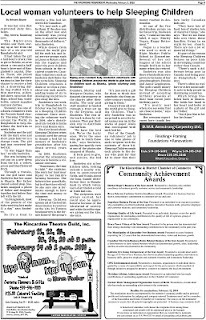 All of the reports did not fit into the newsletter but you can read them in their entirety here. 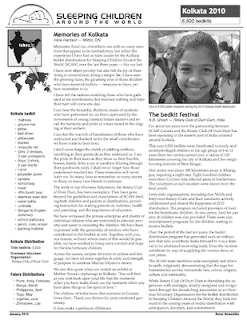 The donor newsletter for the Kolkata bedkit distribution has gone to print and can be downloaded from the Sleeping Children Website. Photos are available in the Kolkata 2009 Photo Album. You can view them by clicking the link above. It was her eyes that captivated Judy Snobelen. The Ripley-area woman saw them staring up at her from the face of a six-year-old Bangladeshi girl. It had taken the girl a half-hour’s truck ride to get to Belabo, an area about a two-and-a-half hour’s drive east of Bangladesh’s capital, Dhaka. There, she joined 800 other kids patiently waiting in line for their chance to receive a bed kit: a drawstring duffle bag stuffed with a thin mattress, pillow, bed sheet, rain coat, flip flops, school bag, water bottle, school supplies and new clothes. Snobelen was one of a dozen volunteers with the Toronto-based charity Sleeping Children around the World, in Bangladesh to help distribute the bed kits to needy kids. Snobelen met the girl with the dark eyes and short pixie haircut in a change room. The girl had just received her bed kit. “It was bigger than her,” recalls Snobelen. She was helping the girl put on a new dress from the kit, a yellow, green and blue flowered frock. Through a translator, the girl later told Snobelen that her name is Shanta. Her father owned a small shop. Snobelen snapped a photo of father and daughter together just before they left with the kit. “In Bangladesh, most of the parents of the kids receiving kits make $1 a day,” says Snobelen. So it’s a treat to receive a free bed kit worth $35 Canadian. “It’s just such a gift for them. If the shoe was on the other foot and somebody was giving here, it would be worth thousands (of dollars),” says Snobelen. While donors from around the world give $35 for each kit, and local service groups such as Lions or Rotary clubs buy the supplies and select the poor children from schools in the recipient countries, Canadian volunteers such as Snobelen distribute the kits to the kids. Sleeping Children organizes a dozen or so trips a year, about one each month, sending teams of six to developing countries to give away the kits. Snobelen’s two-week trip to Bangladesh in October was her fourth as a Sleeping Children volunteer. Since starting the volunteer work in 2004, she’s distributed kits to kids in India twice and Kenya once. She first heard about Sleeping Children when a cousin used the group to donate a bed kit in memory of Snobelen’s grandfather, after his death several years ago. In 2003, Snobelen started the orientation process to become a volunteer overseas. “Sometimes, the time is right,” she explains. She rents her land near Ripley to her family’s farming business. She babysits her grandkids, but is otherwise retired. So she says she is fortunate enough to have the time and money to volunteer. Sleeping Children spends all of the bed kit donor money it receives on the kits. Its Toronto headquarters is the former home of the group’s founders, Murray and Margaret Dryden, who donated the property to the charity after their deaths. The only paid staff member is funded through a trust set up by the Drydens, said Snobelen. The rest of the work is done by volunteers. They pay their own way to distribute the bed kits. “We have the best job. We’re the lucky ones. We’re the ones who get to touch these kids,” says Snobelen, gazing her sparkly eyes at one of the photos she snapped of Shanta. It feels good to give, and receive, the bed kits. Snobelen sits at her kitchen table, looking outside a nearby window to snow-covered fields, and thinks about the long, humid distribution days in Bangladesh in which volunteers distributed a total of 9,000 bed kits. The recipients were always excited, but could also be apprehensive because of the whirlwind of activity and white-faced foreigners giving out the kits, she says. Donors from all over the world give to Sleeping Children. That’s why Snobelen was so surprised to see a few local names pop up in the stacks of paper labels that correspond with each bed kit. Part of the Canadian volunteers’ job is also to take photos of each recipient with the contents of their kit. Sleeping Children sends each photo to the donor who paid for that kit to show that their money reached its destination. Vogan is a teacher who used to work at Elgin Market Public School in Kincardine. Several of her colleagues at the school bought bed kits in her name when she retired. Snobelen was also there when bed kits were given in the name of her granddaughters, Brooke and Annie Leppington. The girls raised money for Sleeping Children instead of accepting birthday presents at their most recent joint birthday party. “It’s pretty neat when you see some that are close to home,” says Snobelen. Her overseas experiences have taught her how lucky Canadian kids are. It’s part of the reason why Sleeping Children focuses on poor kids in developing countries rather than Canada. “There’s such a difference being poor in Canada and being poor in Bangladesh,” she says. There’s often no welfare or other social safety nets to help people in developing countries. Which brings Snobelen back to Shanta. She holds her hand to her heart and looks at a photo of the girl and her father.